Ken Hite (he’s worked on so many RPGs I’ve lost track; LUG Star Trek is the one I most recall) wrote a review of BRP (Chaosium’s d100 system-neutral game) a few years back. I’ve copied it here and highlighted a few points. I need to check out the ‘Passions’ mechanic. Consider this the most comprehensive playtest review in history. I’ve probably logged more hours playing one or another form of Chaosium’s Basic Role-Playing engine — the core of Call of Cthulhu, RuneQuest, Nephilim, Stormbringer, Superworld, and Ringworld, to mention only the games that I’ve played with it — than every other RPG system combined. Including, I should add, using it as a “generic” engine for games from wild multiversal action to steampunk to Westerns to space opera to, well, occult horror investigation. I’ve also, for what it’s worth, written plenty of rules for it professionally, mostly for Nephilim and for Mongoose’s latest iteration of RuneQuest. So I was glad to see that Sam Johnson and Jason Durall did a pretty darn good job of creating a core book for the game I’ve been running, off and on, for the last 25 or so years. 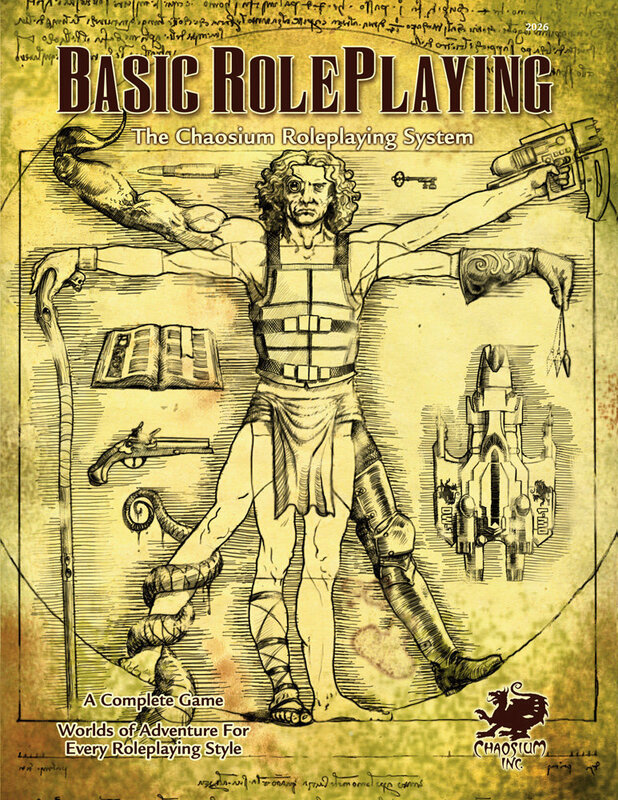 Basic RolePlaying: The Chaosium Roleplaying System (399 pages, black-and-white softcover, $39.95) takes all those Chaosium core books and filters them down into one generic RPG system. In my experience, BRP remains excellently suited for any game in which combat is dangerous and something important reliably happens outside combat. It breaks down for demigods, but it breaks cleanly — there’s not enough rules to become cumbrous. BRP is also excellently suited for the modular attachment of any other, non-Chaosium game mechanics that you happen to like: at one time or another, I’ve added Ars Magica magic,GURPS advantages and disadvantages, and the old Marvel SuperHeroes superpowers (I’m not a fan of percentile superpowers) to BRP with less trouble than it took to type this sentence. (Not for the same game, I hasten to add. Although…) In short, it’s the cleanest, simplest, easiest generic system around. This is not to berate baroque (GURPS), complex (HERO), challenging (FUDGE) generic systems — but it’s nice to have a really good loaf of white bread, too. And now it’s in one book, not 20.